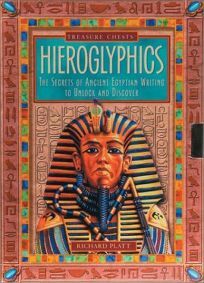 Aspiring archeologists will enjoy cracking open the latest Treasure Chests kit, Hieroglyphics: The Secrets of Ancient Egyptian Writing to Unlock and Discover by Richard Platt. The cardboard chest, complete with metal clasp and key to keep its mysteries secret, contains a 32-page paperback about the history of hieroglyphics in Egyptian, Aztec and Mayan cultures, on one side. On the other, youngsters will find hieroglyphic stamps with inkpad, a clay tablet with stylus and a seal, paper board games, maps, a cardboard temple to construct and more.